Beth Orton review: distinctive and emotive. 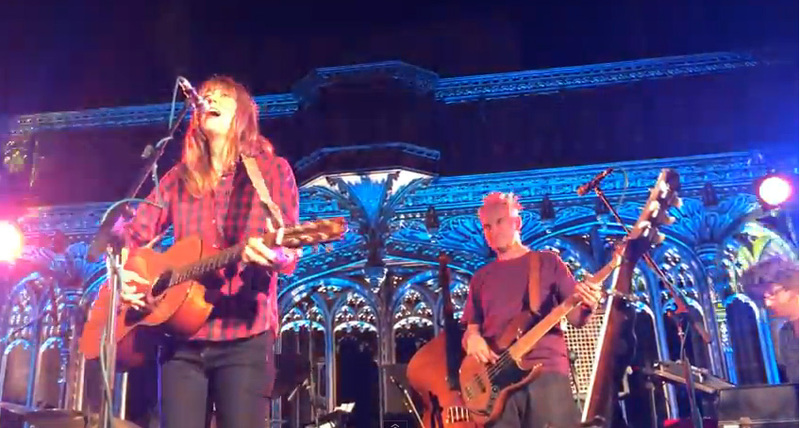 In the reverent and historical womb of Manchester Cathedral, Beth Orton’s irrelevant in-between banter gave a grounded and personable quality to her overall performance; displaying the kind of bittersweet songs that made her a success in the mid-nineties. A recognition of an album anniversary- 1999’s Central Reservation– this middle gig of three sees Beth playing the album in its (almost) entirety. After a six year gap between 2006’s Comfort of Strangers and 2012’s Sugaring Season, it did seem as if Beth had quit music for good, or the music had quit her. Raising a child and getting married apparently took precedence, but now, in 2014, it’s so good to have her back. The set started with no fuss or fanfare; straight into the familiar sound of ‘Stolen Car’. Although Beth’s vocals sound slightly more strained than in past years, the slightly ragged quality suits the songs of love and loss and her overall voice is as distinctive and warm as ever. It’s also clear that her guitar playing, which was never anything but good, has now developed into a more fluid and natural engagement with her instrument; it’s as unique and personal as her voice. Although the remit to play all of Central Reservation isn’t exactly abandoned (practically all the tracks are there), Beth decided to mix up the running order with performances of other songs, old and new. The appearance of ‘She cries your name’ and ‘Galaxy of emptiness’ in the set is therefore not surprising, and very welcome, but far more of interest were newer tracks like ‘Mystery’, which I’d never heard live before. Her pedestrian version of the album’s title track quickly gives way to a loop-enhanced rendition which calls to mind the many remixes of the track, and her early recordings with The Chemical Brothers. It was one of my gig highlights and one of the few times the band really go up-tempo and almost rock out. Not that rocking out is why I’ve come here. For the most part I get exactly what I wanted, which is some beautifully observed and fractured lyrics delivered emotively by the woman who wrote them, with a slower, engaging melancholy sound. Added to the fact that we were all in such a gorgeous venue, with such infectious atmosphere, this concert really delivered, Even Beth seemed genuinely pleased and happy with the results. Her encore, including ‘Feel to Believe’ is worth a mention, but it was her earlier rendition of ‘Pass in Time’, the album’s centrepiece, which struck me in the heart with bittersweet yearning. Even without the late Terry Callier sharing vocals, Beth’s solo version still brought a lump to my throat. Some music can take life’s pain and give it back to you; seemingly filling a hole you didn’t realise was there. It was the emotive highlight of a special evening. Awkward, scatty, irreverent and slightly goofy: if I was a female folk singer I would probably be Beth Orton, and that’d be enough reason for me to like her, but on the music alone it’s not difficult to feel something extremely positive. It had been a while, but on the strength of tonight I can’t wait to see Beth again. Let’s hope it’s not as long until the next time.